The stakes are higher than ever, as Super-Villains more ambitious and depraved are introduced, and a realignment of alliances shakes up the fight for power in Gotham. 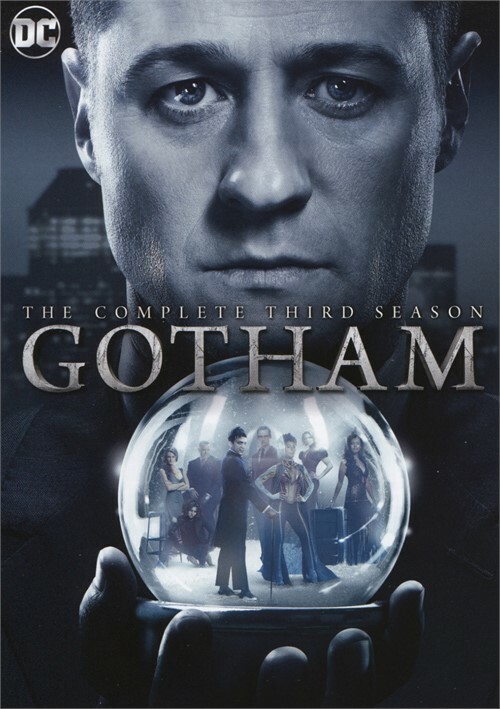 Season three of Gotham peels back the curtain on the infamous criminal organization known as the Court of The Owls. With the Indian Hill escapees on the loose, Jim Gordon must take matters into his own hands, as a bounty hunter in Gotham. He makes it his mission to find Hugo Strange and Fish Mooney. Meanwhile, GCPD’s Bullock and Barnes remain at the forefront of the fight against crime in the monster-ridden city. And Bruce Wayne discovers still more secrets behind his parents’ murder. As the city sinks deeper into chaos, Gotham’s Super-Villains will be joined by the future Poison Ivy, a young woman who's harnessed the full power of her charms; the Tweed Brothers; and a talented hypnotist teetering on the edge of madness who goes by the name of the Mad Hatter.